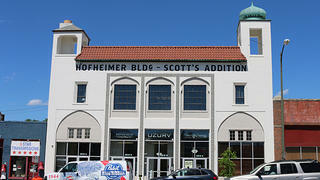 The Hofheimer Building was built in 1928 and served as a rug cleaning facility. In 2016 it reopened with a rooftop bar, a restaurant, office space, and an art gallery. You’d be hard pressed to find a better example of the way historic tax credits can rejuvenate a whole city than in the industrial Richmond, Virginia neighborhood of Scott’s Addition. If manufacturing built the district in the 1930s, then in many ways the state’s historic rehabilitation tax credit has rebuilt it in the 21st century. According to the Virginia Department of Historic Resources, there have been 36 tax credit projects in the 152-acre neighborhood since 2005, with a total of just under $133 million in eligible expenses. And that’s to say nothing of ineligible investment in adaptive reuse projects made possible by the tax credit. The flurry of development started in 2005, when the neighborhood was listed as a historic district on the National Register, but the seeds were planted about a decade earlier, when the state’s General Assembly instituted its own historic rehabilitation tax credit in 1996. It was the culmination of decades of work from organizations like the Preservation Alliance of Virginia, which in the mid-1990s commissioned a major economic impact study that would lay the groundwork for tax credit legislation under Governor George Allen. Kathleen Kilpatrick, a state employee and preservationist, was one of the people who saw the potential for reuse in so many historic buildings statewide. Virginia was already one of the leading recipients of federal tax credits, so the demand was obvious. Blue Bee Cider operates in the old city-owned stables. In 2000, the state increased its credit to 25% of eligible rehabilitation costs, supplementing the 20% available under the federal program. And Virginia’s has another key difference: it allowed homeowners to take advantage of the program, unlike the federal credit which is limited to profit-generating property. That led to a reinvestment in older residential neighborhoods, increasing housing stock and reinforcing the city’s historic charm. After decades of people moving out, population was finally on the rise again by the early 2000s. Initially, Scott’s Addition wasn’t an obvious target for development. The amount of available building stock with the square footage for conversion made it attractive, but having been an industrial neighborhood for so long, it lacked some needed residential amenities. Many of the streets don’t have sidewalks; they were designed for trains and trucks to navigate, rather than pedestrians. The neighborhood was named for General Winfield Scott, who served all the way from the War of 1812 to the Civil War, and whose estate occupied much of the land during the 19th century. In the early 1900s, Richmond sought to move its railroads out of the heart of its downtown, opening the nearby Broad Street Station (which has been since converted into the Science Museum of Virginia) in 1919. By the 1930s, Scott's Addition's proximity to the RF&P railroad made it perfect for industrial use. Walking around, you can still see remnants of the offshoot tracks that would bring trains directly into the manufacturing facilities. Entrepreneur and preservationist Courtney Mailey restored historic stables, once owned by the city of Richmond, Virginia, to found Blue Bee Cider. But as Richmond suffered through the later part of the 20th century, so did Scott’s Addition. Some manufacturers stayed, but many moved elsewhere, and the neighborhood remained relatively stagnant. 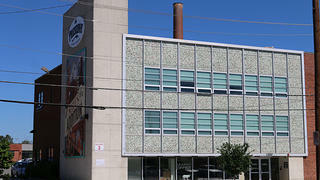 At the Industrial Moderne-style Preserve, there are new apartments in what was once a Coca-Cola bottling facility. It wasn’t until a group of community members sought historic designation as a way to coax development that things started heating up. Kimberly Chen was working as a tax credit consultant when she helped write the application for the National Register, which highlighted the area’s importance in the city’s growth during the 20th century. Now working in the city’s Planning and Preservation Department, she says not even she could imagine how much the designation would do for the neighborhood. What stands now is a mixed-use neighborhood in the most literal sense. There’s still a sizeable industrial component, particularly towards the district’s northern and western borders where it runs up against the railroad and highway. The amount of residential units has exploded with the conversion of factories and warehouses, and it’s become a destination for craft beer lovers with ten breweries and distilleries either in or just outside the historic district. As it turns out, spacious manufacturing plants are also perfect for brew tanks and canning equipment. At the 1928 Hofheimer Building, which sits at the neighborhood’s southern border, hip crowds enjoy drinks (brewed in the neighborhood, of course) and music on the rooftop of what was once a rug cleaning facility. Its Exotic Revival style stands out in the neighborhood of mostly Art Deco, Industrial Moderne, and Colonial Revival architecture. Downstairs, there’s a gourmet Chinese restaurant and office space for a local tech startup. By all measures, the building’s been a hit—but developer Carter Snipes says it probably wouldn’t have happened with the tax credits. What grew up as a major light industrial hub in the 1930s has become an example of how adaptive reuse and historic tax credits can transform cities. 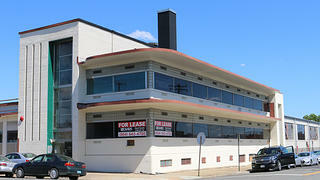 The HandCraft Cleaners building (built in 1946) was a glass factory and then an industrial dry cleaning facility. It's currently being converted into office and retail space, as well as a brewery. He says that its marketability was initially hurt by its lack of on-site parking, but that hasn’t been a problem since it opened in 2016. 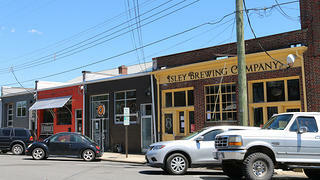 Infill development has added density and created a more walkable environment. The neighborhood will also be served by a coming rapid bus line, making it easier for people to live or work there without owning a car. According to a 2014 study conducted by Virginia Commonwealth University, the state’s historic tax credit has leveraged almost $4 billion in rehabilitation investment since it came into effect. Still, it remains under threat. Earlier this year, there was discussion in the General Assembly of capping the program. 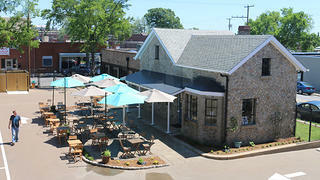 The neighborhood is now home to 10 different breweries and distilleries. But Elizabeth Kostelny, CEO of Preservation Virginia, is confident that as stories like Scott’s Addition’s become the norm, legislators will appreciate how much the the tax credit has done.